Bright bold lips are trending this Spring/Summer, I can't wait till then so I've been sporting a pop of colour on my lips this past week. It's surprising how much a lip colour can really change your look and mood. Having a nice pop on colour on the lips makes me feel happy and confident, plus it means I can normally get away with minimal eye makeup making the focus purely on the lips. The three bold lips which I've been sporting recently are : Maxfactor Colour Elixir in the shade Bewitching Coral, Shiseido perfect Rouge in the shade PK417 and lastly the newest lip colour on the block is the new Rimmel London Apocalips in the shade Stellar. Maxfactor Colour Elixir Lipsticks are so creamy and moisturising, they don't dry out the lips like so many lipsticks. It's very similar to Mac Cremesheen formulation wise, it leaves the lips with a very pretty sheen. 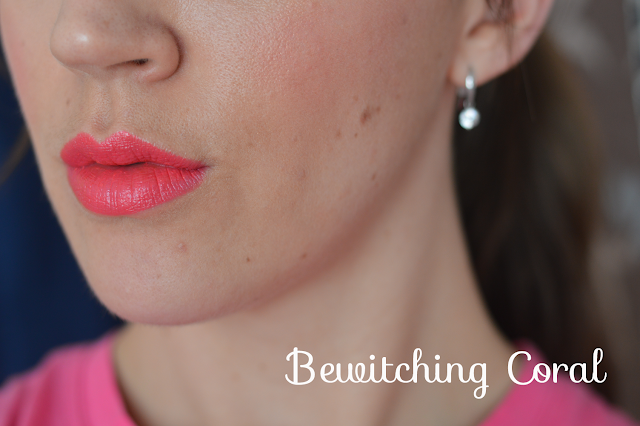 The shade is stunning, a lovely bright coral which gives the lips a nice pop! I especially like wearing this shade for a night out, it's also a great Summer shade. 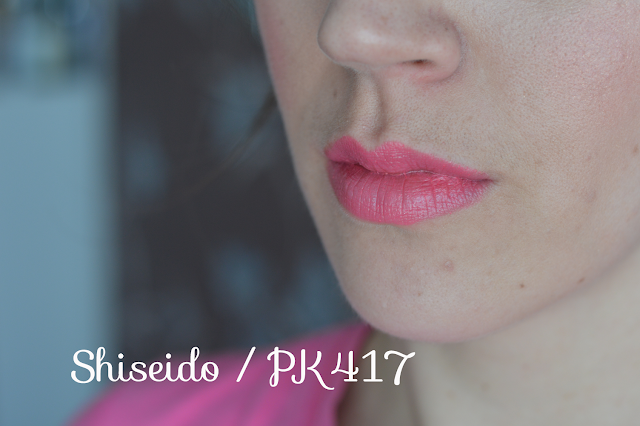 This is the only lipstick I've tried from Shiseido, after my love for this I would be interested to try some other bright shades. It's a shame they don't have names the shades but instead they are coded. It's a beautiful warm pink with golden shimmer running through it, the shimmer is visible in the sunlight but not over the top. 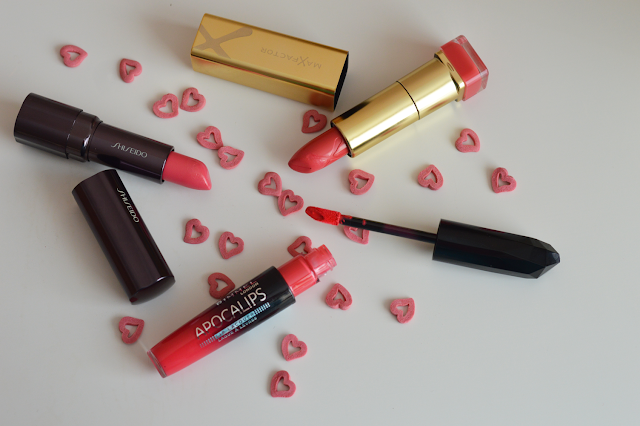 This is the perfect shade for days when you want a subtle pop of colour on the lips. A very wearable daytime shade, reminiscent of the Spring. The formulation is creamy and applies easily. I jumped on the Apocalips band waggon and headed straight for Stellar, this is probably the punchiest out of the trio featured. A true POP of colour on the lips, I adore everything about it. I like the packaging, the scent, the applicator and the shade! I can't wait to get more shades. The formulation is very pigmented and easy to apply. it may look like a lip gloss but it's an in between, it doesn't have a sticky finish to it as you can see from the photo above. It's basically a liquid lipstick which has a nice sheen to it. 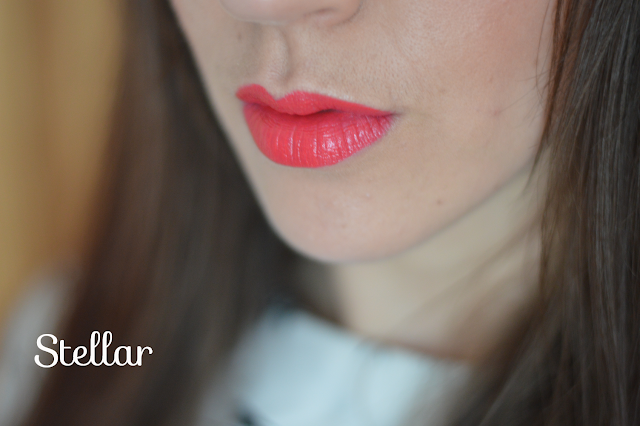 Stellar is a vibrant coral red which brightens your complexion instantly, making you look fresher and healthier. I think out of all the shades this is the one to look out for! 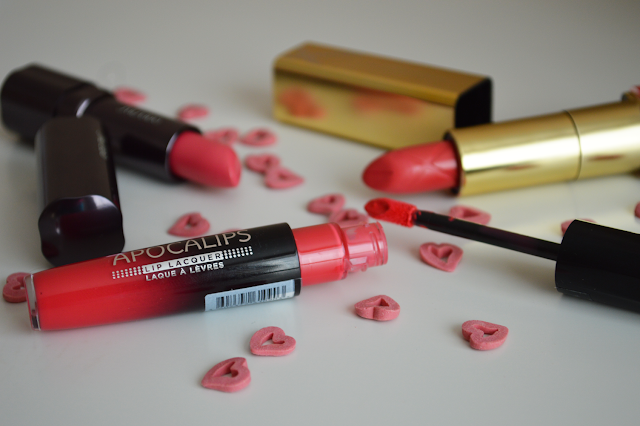 Have you been sporting Pop Lips?